St. ALPHONSA was born in Kudamalur, the Arpookara region, in the diocese of Changanacherry, India, on the 19th of August 1910, of the ancient and noble family of Muttathupadathu. From her birth, the life of the Blessed was marked by the cross, which would be progressively revealed to her as the royal way to conform herself to Christ. Her mother, Maria Puthukari, gave birth to her prematurely, in her eight month of pregnancy, as a result of a fright she received when, during the sleep, a snake wrapped itself around her waist. Eight days later, the 28 of August, the child was baptised according to the Syro-Malabar rite by the Fr. Joseph Chackalayil, and she received the name Annakutty, a diminutive of Anne. She was the last of five children. Her mother died three months later. Annakutty passed her early infancy in the home of her grandparents in Elumparambil. There she lived a particularly happy time because of her human and Christian formation, during which the first seeds of a vocation flowered. Her grand-mother, a pious and charitable woman, communicated the joy of the faith, love for prayer and a surge of charity towards the poor to her. At five years of age the child already knew how to lead, with a totally childish enthusiasm, the evening prayer of the family gathered, in accordance with the Syro-Malabar custom, in the "prayer room". 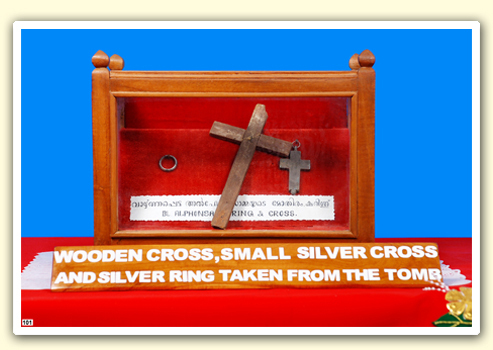 Annakutty received the Eucharistic bread for the first time on the 11 of November 1917. She used to say to her friends: "Do you know why I am so particularly happy today? It is because I have Jesus in my heart!". In a letter to her spiritual father, on the 30 of November 1943, she confided the following: "Already from the age of seven I was no longer mine. I was totally dedicated to my divine Spouse. Your reverence knows it well". 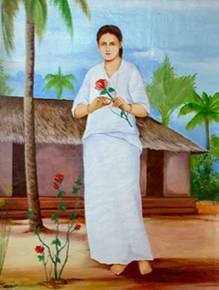 In the same year of 1917 she began to attend the elementary school of Thonnankuzhy, where she also established a sincere friendship with the Hindu children. When the first school cycle ended in 1920, the time had come to transfer to Muttuchira, to the house of her aunt Anna Murickal, to whom her mother, before she died, had entrusted her as her adoptive mother. Her aunt was a severe and demanding woman, at times despotic and violent in demanding obedience from Annakutty in her every minimal disposition or desire. Assiduous in her religious practice, she accompanied her niece, but did not share the young girl’s friendship with the Carmelites of the close-by Monastery or her long periods of prayer at the foot of the altar. She was, in fact, determined to procure an advantageous marriage for Annakutty, obstructing the clear signs of her religious vocation. The virtue of the Blessed was manifested in accepting this severe and rigid education as a path of humility and patience for the love of Christ, and tenaciously resisted the reiterated attempts at engagement to which the aunt tried to oblige her. Annakutty, in order to get out from under a commitment to marriage, reached the point of voluntarily causing herself a grave burn by putting her foot into a heap of burning embers. "My marriage was arranged when I was thirteen years old. What had I to do to avoid it? I prayed all that night... then an idea came tome. If my body were a little disfigured no one would want me! ... O, how I suffered! I offered all for my great intention". The proposal to defile her singular beauty did not fully succeed in freeing her from the attentions of suitors. During the following years the Blessed had to defend her vocation, even during the year of probation when an attempt to give her in marriage, with the complicity of the Mistress of Formation herself, was made. "O, the vocation which I received! A gift of my good God!.... God saw the pain of my soul in those days. God distanced the difficulties and established me in this religious state". It was Fr. James Muricken, her confessor, who directed her towards Franciscan spirituality and put her in contact with the Congregation of the Franciscan Clarists. 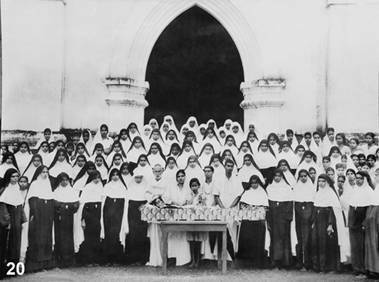 Annakutty entered their college in Bharananganam in the diocese of Palai, to attend seventh class, as an intern student, on the 24th of May 1927. The following year, on the 2nd of August 1928, Annakutty began her postulancy, taking the name of Alphonsa of the Immaculate Conception in honour of St. Alphonsus Liguori, whose feast it was that day. 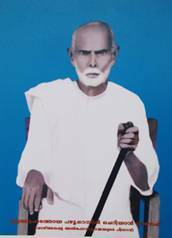 She was clothed in the religious habit on the 19th of May 1930, during the first pastoral visit made to Bharananganam by the Bishop, Msgr. James Kalacherry. The period 1930-1935 was characterised by grave illness and moral suffering. She could teach the children in the school at Vakakkad only during the scholastic year 1932. Then, because of her weakness, she carried out the duties of assistant-teacher and catechist in the parish. She was engaged also as secretary, especially to write official letters because of her beautiful script. The canonical novitiate was introduced into the Congregation of the Franciscan Clarists in 1934. Though wishing to enter immediately, the Blessed was only admitted on the 12th of August 1935 because of her ill health. About one week after the beginning of her novitiate, she had a haemorrhage from the nose and eyes and a profound organic wasting and purulent wounds on her legs. The illness deteriorated, to such a point that the worst was feared. Heaven came to the rescue of the holy novice. During a novena to The Servant of God Fr. 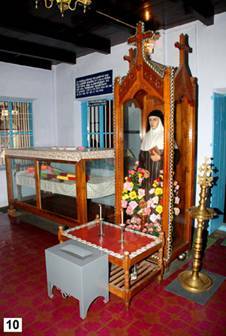 Kuriakose Elia Chavara - a Carmelite who today is a Blessed—she was miraculously and instantaneously cured. Having restarted her novitiate, she wrote the following proposals in her spiritual diary: "I do not wish to act or speak according to my inclinations. Every time I fail, I will do penance... I want to be careful never to reject anyone. I will only speak sweet words to others. I want to control my eyes with rigour. I will ask pardon of the Lord for every little failure and I will atone for it through penance. No matter what my sufferings may be, I will never complain and if I have to undergo any humiliation, I will seek refuge in the Sacred Heart of Jesus". The 12th of August 1936, the feast of St. Clare, the day of her perpetual profession, was a day of inexpressible spiritual joy. She had realised her desire, guarded for a long time in her heart and confided to her sister Elizabeth when she was only 12 years old: "Jesus is my only Spouse, and none other". Jesus, however, wished to lead His spouse to perfection through a life of suffering. "I made my perpetual profession on the 12th of August 1936 and came here to Bharanganam on the following 14th. From that time, it seems, I was entrusted with a part of the cross of Christ. There are abundant occasions of suffering... I have a great desire to suffer with joy. It seems that my Spouse wishes to fulfill this desire". Painful illnesses followed each other: typhoid fever, double pneumonia, and, the most serious of all, a dramatic nervous shock, the result of a fright on seeing a thief during the night of the 18th of October 1940. Her state of psychic incapacity lasted for about a year, during which she was unable to read or write. In every situation, Sister Alphonsa always maintained a great reservation and charitable attitude towards the Sisters, silently undergoing her sufferings. In 1945 she had a violent outbreak of illness. A tumor, which had spread throughout her organs, transformed her final year of life into a continuous agony. Gastroenteritis and liver problems caused violent convulsions and vomiting up to forty times a day: "I feel that the Lord has destined me to be an oblation, a sacrifice of suffering... I consider a day in which I have not suffered as a day lost to me". With this attitude of a victim for the love of the Lord, happy until the final moment and with a smile of innocence always on her lips, Sister Alphonsa quietly and joyfully brought her earthly journey to a close in the convent of the Franciscan Clarists at Bharananganam at 12.30 on the 28th July 1946, leaving behind the memory of a Sister full of love and a saint. The next day 29th July 1946, witnessed a funeral which was very simple. 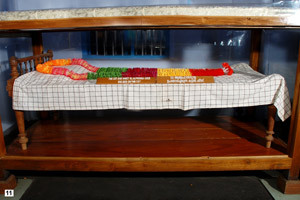 The coffin was carried in procession to the parish church by the sisters of the convent. At the Requiem Mass her special Spiritual Director gave the prophetic sermon. Her body was laid to rest in the tomb of the newly built cemetery chapel. It was providential that Alphonsa was buried at the very same spot where one finds her venerated tomb located today. 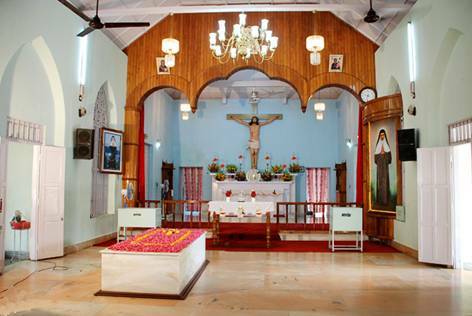 St. Alphonsa’s room was very near to the convent school and the students had developed a very close contact with her. They were inspired and motivated by the holiness of Sr. Alphonsa. Her life was very short as she died at the age of 36. From the very next day after the funeral, the school children went to her tomb to put flowers and lighting candles on her grave. They found their favours received. Soon the fragrance of her virtues and saintly life spread far and wide and many miracles happened through her intercession. Taking into account the numerous miraculous cures happened through the intercession of St. Alphonsa, Mar Sebastian Vayalil, the bishop of Pala initiated the preliminary steps for her beatification and on 2nd December, 1953 H. E. Cardinal Tisserant formally inaugurated the process. 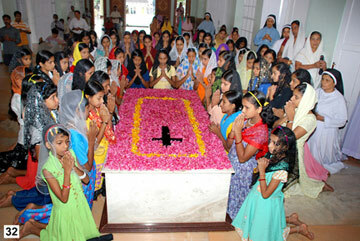 After the long process of investigation, Sr. Alphonsa was beatified by H.H. Pope John Paul II along with Rev. Fr. Kuriakose Chavara CMI at Kottayam, Kerala. The Canonization of Bl. Alphonsa was on 12th October, 2008 by H. H. Pope Benedict XVI at Vatican. On 2 December 1953, Eugène-Gabriel-Gervais-Laurent Cardinal Tisserant inaugurated the diocesan process for her beatification. Pope John Paul II formally approved a miracle attributed to her intercession and Alphonsa was declared Servant of God on 9 July 1985. 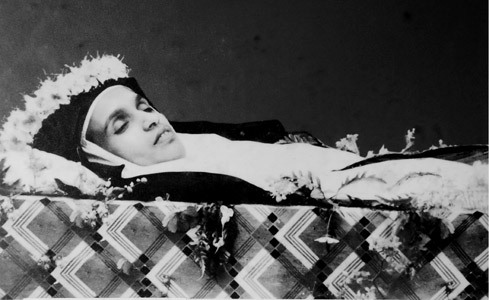 She was then known as Venerable Sister Alphonsa.